Here’s a sad story about Sony: In the four years that I’ve been reviewing Android smartphones, Sony’s Android devices have typically scored remarkably well. But the company hasn’t put as much marketing mojo behind its smartphone lineup like it has with some of its other product divisions, and it’s difficult to keep up the excitement after you realize that once Sony announces a smartphone, it feels like forever until it materializes in the U.S. This is why I can’t allow myself to get too excited over Sony’s new lineup of Xperia X devices: the Xperia X Performance, Xperia X, and Xperia XA. Each smartphone in this batch possesses its own unique, individual identity, with the idea that there’s something for every type of user. The three Xperia X smartphones were all announced during Mobile World Congress, and fit in as part of Sony’s new approach of adding “layers of intelligent technology.” This message is particularly prevalent with its lineup of concept devices, but the smartphones possess a bit of that element, too. The Xperia X Performance is definitely thick, but it has lots of capable hardware on the inside. The Xperia X Performance is considered the top tier of the three smartphones in Sony’s latest lineup. It features a 5-inch, 1080p screen with Sony’s proprietary Triluminos technology, as well as a 23MP rear-facing camera, a 13MP front-facing camera, and a 2700mAh battery pack, which at this point is a bit smaller than most of the other flagship phones making the rounds. The X Performance also runs on a Snapdragon 820 and, like the Xperia phones of the past, it’s water-resistant. The Xperia X Performance’s rear-facing camera features predictive capabilities. The Xperia X comes in a variety of kooky colors, like this lime green. The Xperia X is the mid-range counterpart of this smartphone trio. It features most of the same specifications as the X Performance, save for a slightly smaller, 2620mAh battery pack. It also runs on a Snapdragon 650 and is not water resistant. The brushed aluminum backside is a far departure from Sony’s all-glass construction of year’s past. I was able to handle this particular phone and, again, I’m reminded of how disappointing it is that Sony’s phones don’t all make it to the U.S. The Xperia X features rounder edges than its Xperia Z predecessors, and instead of edge-to-edge glass, it has a brushed aluminum backside. Sony continues to place the power button exactly where you thumb rests on the right-side of the phone—if you’re right handed, of course. You can expect a similar button configuration, too, with the power button on the right-hand side of the chassis placed where your thumb would typically grip the phone. 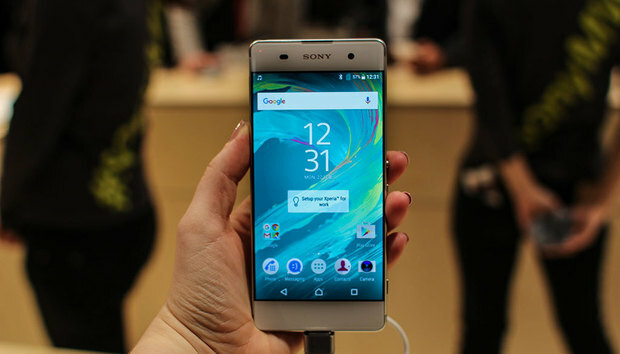 The phone also runs Sony’s version of Android 6.0 Marshmallow. Sony’s low-end device doesn’t look anything like it. I spent a little more time with Sony’s lower-end Xperia XA because I was intrigued by the fact that this phone sports an entirely different design language than its two brothers, even though it’s cheaper. I really liked the picture quality on the Xperia XA’s 720p display. The Xperia XA’s design appears to be a spin on the traditional polycarbonate shell, with a slight slope on either edge. It looks great, but the only drawback is that the screen is a mere 720p. At the very least, the screen is bright and saturated enough for watching movies and editing photos, which is not something you typically get with a phone in this category. The Xperia XA comes in a variety of colors, too, including white, graphite, lime, and rose gold. Inside, the Xperia XA runs on a MediaTek Helio P10 processor, an octa-core chip that uses ARM’s low-power Coretx-A53 cores. (MediaTek’s chipsets are not typically used in U.S. smartphones, which might explain why we don’t have a release date for this device in the States just yet.) It also has 2GB of RAM and 16GB of internal storage, as well as an expansion slot. I did not sense any sort of lag while using the phone in my initial time with it, though there’s no possible way to gauge a device’s performance after only 15 minutes of use. Unfortunately, I didn’t get a chance to use the Xperia X Performance. There were a limited amount of test units to go around, and I hardly had time to use the unit laid out during my briefing with Dan Mesa, Sony’s Senior Director of Marketing. Dan Mesa, Sony’s Senior Director of Marketing, holding the Xperia X Performance. I did learn a bit about the trajectory for the X Performance, though. Mesa said that these three smartphones are meant for millennials who “consume a lot of content,” as well as gaming enthusiasts, which seems obvious considering the integrated PlayStation Remote Play. There’s no concrete release date on any of these three Xperia X devices, save for the Xperia X Performance, which is slated for a summer release.